Your family is in flight. It seems that decades didn’t happen or happened all at once. The next few years are all weddings. On the end of holidays we wait for the next holiday. We remember bombed resorts and the constant cigarettes. People danced at parties with no regard for your safety. One summer the playground had long chains with rings and kids broke arms. All those dumb kids are now actors. The hardest thing is to let go of your retinas, to accept that they are dissolving. This terrible gap in your ground, this open maw makes the house less stable. Whether your fem is dusty does not matter. If it is ringed, settling scores, or waiting—all this does not matter. It is natural, no, expected that you are now afraid of everything. 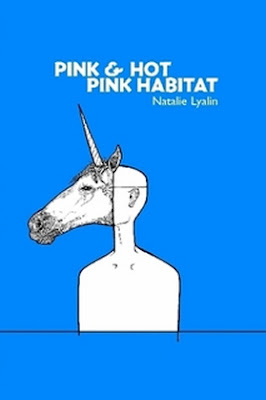 I’ve only recently come to reading Philadelphia poet and publisher Natalie Lyalin’s sincerely playful first collection, Pink & Hot Pink Habitat (Atlanta GA: Coconut Books, 2009). Since then, she’s published twice with Brooklyn’s Ugly Duckling Press—a chapbook, Try a Little Time Travel (2010), and the full-length Blood Makes Me Faint But I Go For It (2014)—neither of which I’ve seen but hope to pick up. Part of what appeals about Lyalin’s poems are the structural range she presents throughout the collection, from clipped lyric poems and extended sequences to prose poems and short fragments, as well as the incredible amount of “serious play” she engages with. These poems are smart and sad and joyously fun, writing out and around and thrusting deep through a variety of distractions to get right at the heart of the matter, such as her poem “From the Suitcase My Back I an Arrow.,” that ends with: “There is no music for months. Put us in that truck. // Give chocolate to the ladies. Racecars to the men. I’m dead right now // and you have the cancer. Can we talk about it. Let’s talk about // your cancer. I have two sweaters. One has a house and chimney.” I need to read some more Natalie Lyalin. Wears her own crown. By the entrance, flowers. child does not know where to find a new glue stick. straight and not at all violent.